Thank you for your interest in our products. Our activism in the hemp re-legalization movement and a belief that hemp products do not have to be so expensive, led us to develop our own line of hemp seed oil products and the High Country Hemp Company LLC in 1993. We are proud to offer our growing line of products and introduce you to the High Country Family. We are committed to quality, good service and to educate the public about the many uses of the amazing cannabis / hemp plant. We invite you to join us as we re-introduce this valuable, renewable natural resource. We are currently in the process of recreating the High Country Hemp Co. For years we have looked forward to being able to produce our products from Colorado grown hemp seed. With current changes in regulation, we may see that desire happen in the near future. We say change in regulation, because that is what we are experiencing across the country at this time. This is not real legalization, which is what this company truly strives for. Once our country chooses to completely legalize this plant for all of its uses, then we will be able to experience ALL of its benefits. Food, Fuel, Fiber and Medicine, it's time for the seeds of change to bare fruit. We have a history and a future in hemp. 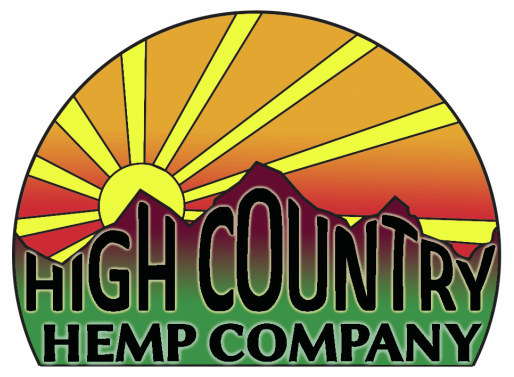 Join The High Country Hemp Company as we take hemp "a little bit higher"! Facts: For the last 80 years, the US government has waged an unfair war against the production of cannabis/hemp and in the process, has denied us the many beneficial products that can be produced from this plant. Hemp is our best source of paper, producing four times as much as trees (per acre) without the devastating effects of logging and the use of sulfur dioxide; the strongest natural fiber, using a fraction of the chemicals required to produce cotton; Hemp seed oil is rich in protein and essential fatty acids, good for the body both inside and out. It also has many industrial applications such as fuel, paints, varnishes, twine / rope, plastics, fiber board and paper. The flowers have been used as medicine for centuries. Used externally, it soothes and moisturizes dry irritated skin. Our products are an excellent example of these benefits. If you have questions or are confused about the hemp issue, we’d be happy to help. Give us a call.